As always,i was reading Pourya's Blog and he wrote this: I’ve always dreamt about having grey or, as we say in Persian, “jogandomi” hair! It might sound strange but when I was just a teenager... and i wanted to say him,well man, welcome to our club, i am a ''jogandomi hair'' too . I am a fashion lover... oh yeah.. this is always a big problem for me because my work and my style,i always get the top mode for me.this is good for men ! is not a sexual thing . women wanna handsome men and fresh men with style ! this is my experience,specially about sexual dates,hehehe . Then don't forget ! be a man ... be yourself ... be a top man . fashion is important for a man.be always fresh . This is aspecial style of the new century . mamnoon amma haminjoori ke nemsihe siamak! hehe, bayad ye axi ham az khodet bezari! Boss, sar-e vaghtesh mizaram ! bavar kon ... alan gereftari ziad hast, ageh bezaram,khanuma dar inja strick mikonan va az zeshti-e man su-e estefadeh mikonan . Man fadat P jan . Some white hairs on men = tres chic! men should always look nice. I have to go for some shopping this week, need a new summer wardrobe! specially casual yet cutting for evenings. 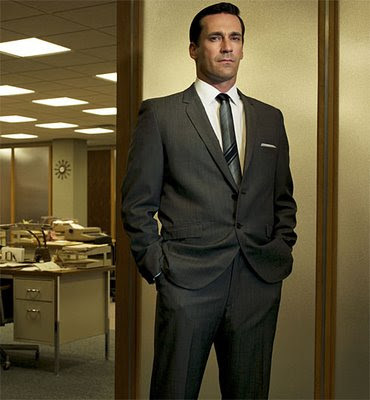 I'm fascinated by MAD MEN at the moment and this has inspired my style subconsciously, I'm incorporating 50's/60s influenced fashion in my wardrobe! Does anyone have any infromation on Fashion Designer Brands' Franchising Rights? Any infromation is extremely appreciated! Thank you! oon vasatie kheili bahale, az tarkibe rangesh kheili khosham miad! Exactly, the variaty of colors is extensive. i think happy colors are good for you ... specially all blues familly ! Nagu un vara hava sard shodeh !!! injaha ma hanuz lokht rah mirim donbale dokhtaraye bikini push . hehe, mamnoon! na to blog neveshtam chera az hala kharidamesh! P jan mard bahas shik bepusheh,beh khosus balayeh 30 32 sal ! hala har ki beh jib-e khodesh !!! hehe, merci! baraye tanavo doost daram gahi street bepoosham. adam az khodesh o riktesh khaste mishe age yeknavakht bepooshe. P jan kolah ye chizi hast keh bahas beh adam biad... beh Shoma miad . P jan dar inja va dar madrid va italy, maghazeh hast keh dore sare shoma ro andazeh migirand va kolah ro hamanjur keh dust dari ba andazeh your head dorost mikonand. daghighan beh sare shoma mikhoreh, tazeh agar moshtari beshi va hamisheh beri keh arzun tar barat dar miad.